In a disturbing incident, a man in Chennai found a blood-stained band-aid in the food item that he ordered through food delivery giant Swiggy. 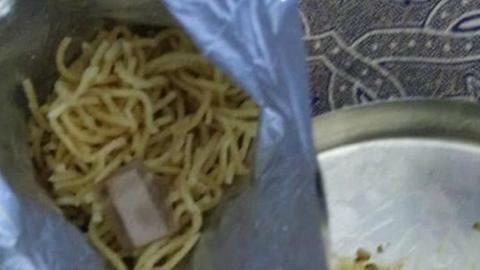 The worse part is that Balamurugan, the customer, discovered the band-aid after he had consumed half of the noodles. He shared his displeasure on a Facebook post recently and claimed that Swiggy wasn't helpful in addressing his concerns. On Sunday, Balamurugan had ordered chicken schezwan chopsuey from Chop N Stix in Selaiyur area in the city using Swiggy app. After eating half of the noodles, he noticed the blood-ridden band-aid in his food. As obvious, Balamurugan was disgusted with the service and contacted both- Swiggy and the restaurant. However, he claimed in his post that he was disappointed with their respective replies. "Contacted restaurant and they aren't sensitive and offering replacement for the food! Who again wants to eat such contaminated food," Balamurugan wrote. "Want to badly sue both restaurant and Swiggy too for partnering with restaurant which doesn't practise general hygienic method like using hand-glove or not allowing any kitchen staff with injured fingers/hands inside," he wrote. Balamurugan told The News Minute that through his Facebook post about the unhygienic service, he wanted to raise awareness among other regular users of Swiggy app. He assured that he was doing absolutely okay health-wise. "I would definitely like to ensure that I've not been infected or that I've contracted any infectious disease by way of eating that food," he said. About contacting Swiggy, Balamurugan said, "There has been no specific update on the particular incident from Swiggy or the restaurant. The last update from Swiggy was that they'll investigate and get back to me in a day or two." "I am expecting the restaurant to take corrective measures, Swiggy to fill gaps in their process of selecting partners," he added. Balamurugan, however, revealed that Swiggy is still taking orders from the same branch of the restaurant "without stopping the service for the restaurant until their vendor does re-audit or quality checks." Meanwhile, Swiggy released a statement responding to The News Minute's article, saying that they "deeply regret the issue faced by one of our users and apologize for the angst it has caused." "While the restaurant has acknowledged a lapse at its end, based on the complaint, we have suspended this outlet pending further investigation by an external agency," Swiggy responded. "Swiggy conducts stringent third-party hygiene audits across our restaurant partner network- regularly, and is invested in working with them to ensure a safe and delightful food experience for our consumers," it added.